Over the next three years, starting in March 2018, we’ve joined forces with three charity partners to create one programme designed to support families when they need it the most. 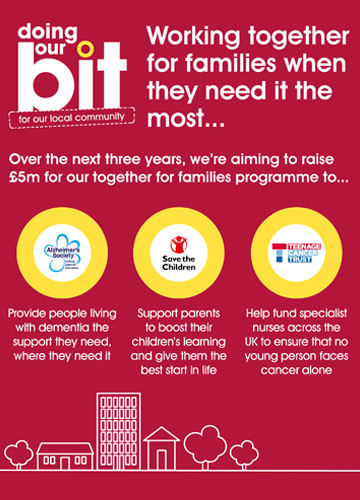 All the charities tackle a key social issue that our customers are often faced with in everyday family life. The funding goes towards helping families in the UK now, when they need it the most. We know life can be tough at times. Whether it’s a diagnosis in the family that’s potentially life threatening, or really struggling to make ends meet, meaning children don’t get off to the best start in life, we hope that through this programme we can raise enough money to make a real difference. Over the next three years, our team members will be taking part in a range of fundraising activities from dressing up and sponsored walks to bake offs and body waxing to help us smash our £5m target. So, please keep an eye out for our fundraising in store and come along and support. To donate to our together for families programme please visit: https://uk.virginmoneygiving.com/TogetherForFamilies, where you can make an online donation. To find out more about the programme and how we’re supporting our three charities, have a read through our Together for Families brochure that tells you everything you need to know.